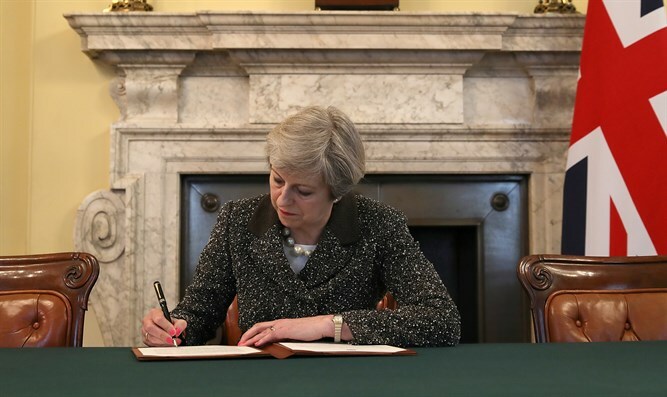 British Prime Minister signs letter that will formally begin the UK's departure from the European Union. British Prime Minister Theresa May on Tuesday night signed the letter that will formally begin the UK's departure from the European Union, the BBC reports. Giving official notice under Article 50 of the Lisbon Treaty, the letter will be delivered to European Council president Donald Tusk on Wednesday. In a statement in the Commons, May will then tell MPs this marks "the moment for the country to come together". The move follows June's referendum which resulted in a vote to leave the EU. May's letter will be delivered to Tusk at 12:30 p.m. Britain time on Wednesday by the British ambassador to the EU, Sir Tim Barrow, according to the BBC. Article 50 gives both sides two years to reach an agreement, so unless both sides agree to extend the deadline for talks, the UK will leave on March 29, 2019. Negotiations are expected to begin in mid-May.